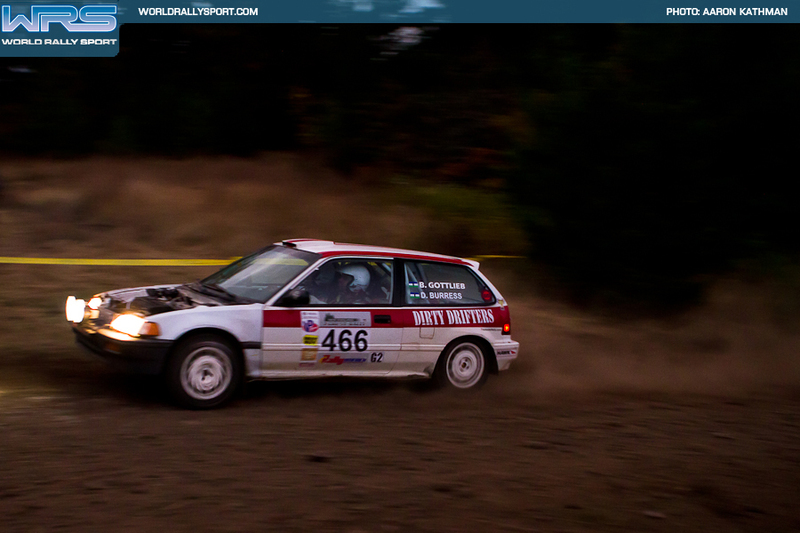 After finding out that we wouldn't be making the Mount Hood Rally due to not finishing our re-prep, I scoured the entry list for a blank co-driver seat. Knowing of Brian Gottlieb's increasing speed in the Dirty Drifters Honda, I sent him a message. He graciously accepted my offer to co-drive. Brian was also prepping his car and got the engine in and running on Wednesday. I drove down with my co-driver housemate Jason Grahn late Thursday and we made our way out to the rally Friday morning, Brian in the RV and me in the Syncro Vanagon. Recce went well and Brian got to practice writing notes. I was the last to sleep of the Dirty Drifters crew as I was working overtime on the notes. I was looking forward to a day in the woods. Stage one was a little rusty for the both of us. Brian was a little wild in a few corners and I turned two pages at once, like a noob. The car was also a bit nervous, as it was creeeping dangerously high up the temperature gauge. The temperature problems would plague us through the rally, but the car never quite overheated all the way. Surprisingly, we led after the first stage. We hit a better rhythm on stage 2, but fell to fourth by 6 seconds. Stage 3 was cancelled due to idiot motorcyclists storming the stage. We maintained our fourth place on stage 4, but lost another second to Adam Crane. Competition was tight between Douganis, Crane, Clark and us. We were all separated by only 7 seconds at the end of the first loop. On the first stage of the second loop, we fell another 8 seconds, despite feeling ecstatic about the notes and the driving. We were let down again as stage 6 was cancelled due to a car blocking the road that had rolled. After the delay, we entered the last stage. Unfortunately, dark was falling. Thanks to some coercing by Rebecca Ruston, the lights were still on the car. We decided to remove the hood (a feature of the Dirty Drifters Honda) and do the last stage with it stashed in the rear of the car as an attempt to mitigate the overheating issues. Brian's night experience paid off on the last stage and we ran the exact same time as the same stage during the day. Two of our competitors could not match that pace and we finished second in class, seventh overall. However, this rally adventure was not over. The awards party happened. Then the after-party began. At a local bar, a few people had arranged free beer for anyone with a rally wristband. Jason and I, as well as a couple other fellow rallyists, closed down the bar. I drove Jason around as we looked for a lodging solution. None was available, so we decided to drive back to seattle at about 3:00 AM. I was feeling awake, so I drive for about an hour and a half before we stopped at a rest stop for a nap. We finished the drive after a healthy three hour nap and a healthy breakfast at a Shari's along the way. Adventure!